Gideup presents the N.E.W. – Naturally Energized Water – Bottle, a stainless steel sports water bottle that turns tap water into energized drinking water from just a refill. Made from food grade stainless steel, the N.E.W. Bottle’s energized water equipment can assist with sports recovery, arthritis, hydration, alkalising and improve acid-base recovery. The N.E.W. Bottle’s ability to turn any clean water source into energized drinking water is arranged in a special manufacturing process. The frequency patterns of clean, natural spring water and oxygen are charged onto the N.E.W. Bottle’s metal. When tap water comes into contact with the bottle, the charged frequency inside the metal is transferred onto the water. This water equipment revitalises the molecular behaviour of the tap water into the same structure as spring water, as well as eliminating water pollutant-related energies. Testing, with Meridian Diagnostics, has established the water from N.E.W. Bottles, available from Gideup, has a positive effect on the energy and harmony of the human body. Testing also at the University of Newcastle has confirmed the N.E.W. Bottle’s energized metal does revitalise tap water into energized drinking water. Gideup’s N.E.W. Bottle provides the human body clean and revitalised drinking water. Several World Class Australian Athletes, such as Duatholon World Champion Oliver Bernhard, has embraced the N.E.W. 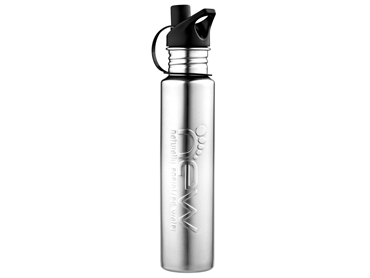 Stainless Steel Sports Bottle.